ETP International and its UAE business partner, Barcode Gulf held their first Retail NEXT in Dubai on 28 November 2007 at the Dusit Dubai hotel. 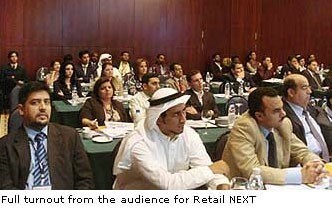 The conference drew more than 70 retailers within the GCC region for the half day session. Speakers presenting at the conference include Mr Arif Shaikh, Business Director of BMA International, Ms Ermin Sevil, Head of Retail Business for Nielsen, Mr Ram Mohan Nair, IT Director of MAF Fashion (Majid Al Futtaim) and Mr Rajkumar Jagasia, Executive Director of ETP International. Mr. Arik Shaikh portrayed the changes brought by the passage of time in the Middle East, depicting the evolution of retail in the UAE. He also shared with the audience BMA’s business strategy of staying competitive and relevant in the changing retail environment. He explained how BMA has evolved from an owner-run retail company to a professionally run one, as well as a traditional retail business to the modern retail format. He unveiled their new strategy for growth through the launch of the “Red Tag” stores. Mr. Rajkumar Jagasia of ETP captivated the audience’s attention with his presentation on how retailers can leverage on technology to build a proactive retail organization. Case studies of ETP customers were shared with the audience, on how they had fully capitalized on the use of technology and business information to build a proactive retail organization. He highlighted the business and process efficiencies that can be better managed with the right tools. The third speaker Ms. Ermin Sevil shared with the audience the changes in global trends and how they will impact the Middle East. Statistics and trend analysis were shown to the audience on the growing sectors and markets. The final session by Mr. Ram Mohan Nair gave a fascinating account from a franchisor perspective of the many challenges a franchisor organization faces in its business processes and information management systems. He described the best practices and the wish list for a singular comprehensive retail solution that will enable retailers to manage the needs of the day as well as prepare for the changes the future holds. A networking luncheon was organised after the half-day conference in which delegates had the opportunity to mingle and speak in private with the speakers. “The turnout for the event has been very encouraging. It exceeded our expectations. The quality of the speakers and their presentations were great and the audience had much to digest after these sessions. The success of the Retail NEXT series has given us great confidence in the reception to the programme and we are keen to bring this to as many countries as possible. The retailers can only gain from this.” commented Mr. Naresh Ahuja, Managing Director, ETP International. Plans are already underway to bring Retail NEXT to India in the next couple of months. ETP International is an enterprise software company focused on enabling retailers to run their business proactively using the cutting-edge ETP V5 Retail Solution. Founded in 1988 ETP has its International HQ in Singapore, R&D centre in Mumbai and a network of partners in over 20 countries, selling, implementing and supporting ETP solutions. ETP’s three digit growth is driven by the wide acceptance of its flagship product ETP V5 by leading retailers.